Chinook parr. Photo by John Volpe. Chinook salmon are the largest of the Pacific salmon, weighing on average 30 lb and measuring 40-60 inches in length. The largest Chinook ever recorded weighed 136 lb and was 63 inches long. Adult Chinook have black gums, are blue-green with silvery sides, and have black spotting on the back, dorsal fin, and tail fin. Their colour darkens as they mature, and becomes olive-brown, reddish, or purplish for spawning. Click here for an illustrated identification guide for the marine (non-spawning) versus freshwater (spawning) phases of Chinook salmon. Chinook are anadromous, meaning they live part of their life in the ocean and part in fresh water. Fry hatch in streams and rivers (sometimes lakes) in spring and remain in fresh water for a varying amount of time before migrating out to sea. Most fry spend about a year in fresh water; however some head to the ocean only three months after hatching, while others stay in fresh water for up to three years. Additionally, once out to sea some Chinook stay close to shore while others migrate long distances (click here for a Pacific Northwest Chinook migration map; click here for a distribution comparison with the other Pacific salmon species). Chinook spend from two to eight years at sea before returning to their natal spawning grounds. The general Pacific salmon migration pattern is north along the coast, westward out to sea, then south and eastward back to the coast. 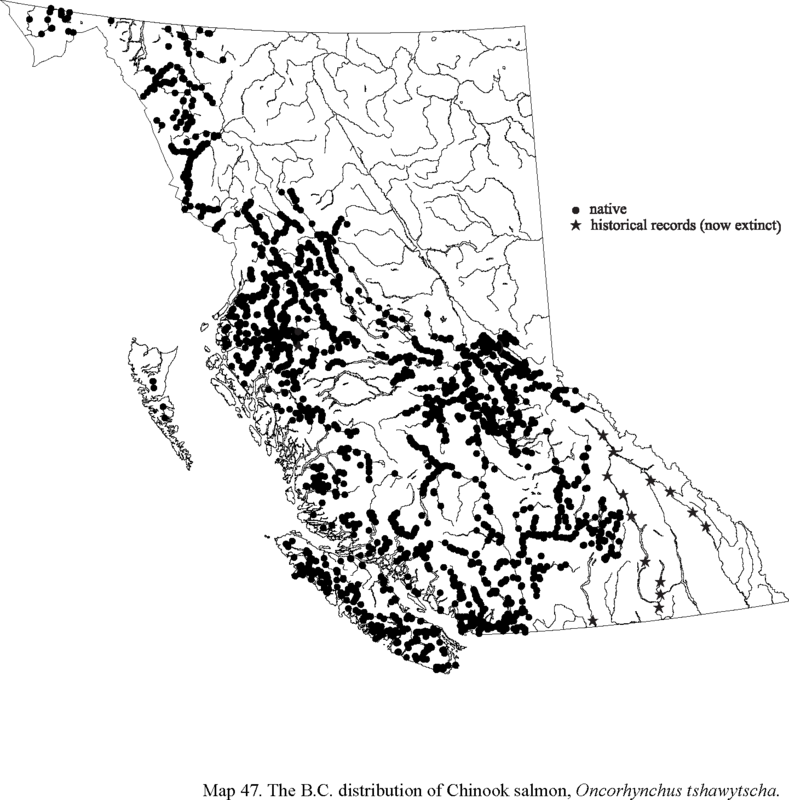 Click here for freshwater distribution map for Chinook salmon in BC. Chinook are native to both sides of the North Pacific: in the Pacific Northwest from the Bering Sea south to southern California; and along the coast of Asia from Siberia to northern Japan. They are also found in the Mackenzie and Coppermine River drainages in the Arctic. Introductions have been attempted at locations around the world, however only a handful of populations have successfully naturalized - these are in the Great Lakes, New Zealand, and Chile. Pink (Oncorhynchus gorbuscha), Chinook, and coho (O. kisutch) all bear black spots. The spots on pink salmon are large and oval-shaped, and on their back and tail fin. Chinook have spots on their back, dorsal fin, and entire tail fin, whereas coho have spots on their back and top tail fin lobe. Chinook and coho can also be distinguished by their lower gums, which are white in coho and black in Chinook. Chinook are highly prized by sport fishermen due to their large size. The pigmentation of Chinook flesh varies from very pale, known as "white spring," to deep pink or red. Lamb and Edgell (2010) recommend using salmon with pale flesh for smoking, and baking or barbecuing individuals with more pigmentation. Pacific salmon have been a vital food source - as well as a central cultural symbol - for coastal First Nations groups for thousands of years, and continue to be a key resource for coastal communities today. There are two behavioural types of Chinook. The "stream-type" fish remain in freshwater for longer and make long migrations into offshore waters. These fish return to freshwater to spawn in the spring and summer. "Ocean-type" Chinook migrate to sea within a few months of hatching, and spend the majority of their ocean life in coastal waters. These fish return to freshwater to spawn in the fall. Chinook are a genetically diverse species, and much of this variation appears to be due to the existence of the two behavioural types. Fisheries and Oceans Canada. (2014). Chinook Salmon (AKA Spring, Tyee and King) Oncorhynchus tshawytscha. Government of Canada. Accessed 12/09/2014. Chinook Salmon (Oncorhynchus tshawytscha). Office of Protected Resources. National Oceanic and Atmospheric Association Fisheries. 12/09/2014. Chinook Salmon, Oncorhynchus tshawytscha. Canada's Arctic. University of Guelph, Guelph, ON. Accessed 12/09/2014. Fisheries and Oceans Canada. (2010). Aquatic Species - Details for Chinook Salmon. Government of Canada. Accessed 12/09/2014. Lamb, A. and Edgell, P. Coastal Fishes of the Pacific Northwest. Revised. (2010). Madeira Park, BC: Harbour Publishing. P. 62-63. MacDuffee, M. and Rosenburger, A. Wild Salmon Program. Projects. Raincoast Conservation Foundation. Accessed 12/09/2014. Oncorhynchus tshawytscha (Walbaum, 1792). In Klinkenberg, Brian. (Ed.). E-Flora BC: Electronic Atlas of the Plants of British Columbia. Lab for Advanced Spatial Analysis, Department of Geography, University of British Columbia, Vancouver. Accessed 12/09/2014. Species and Lifecycle: Chinook. Pacific Salmon Foundation. Accessed 12/09/2014.